Aventura, Florida- King Jewelers, South Florida’s oldest and most reputable jeweler in collaboration with Alpina Genève the official timekeeper of the ’12 Hours of Sebring’, Sebring International Raceway, and Bell Motorsports, will hold an exclusive event dedicated to South Florida’s automobile and timepiece enthusiasts at their store in Aventura, FL. 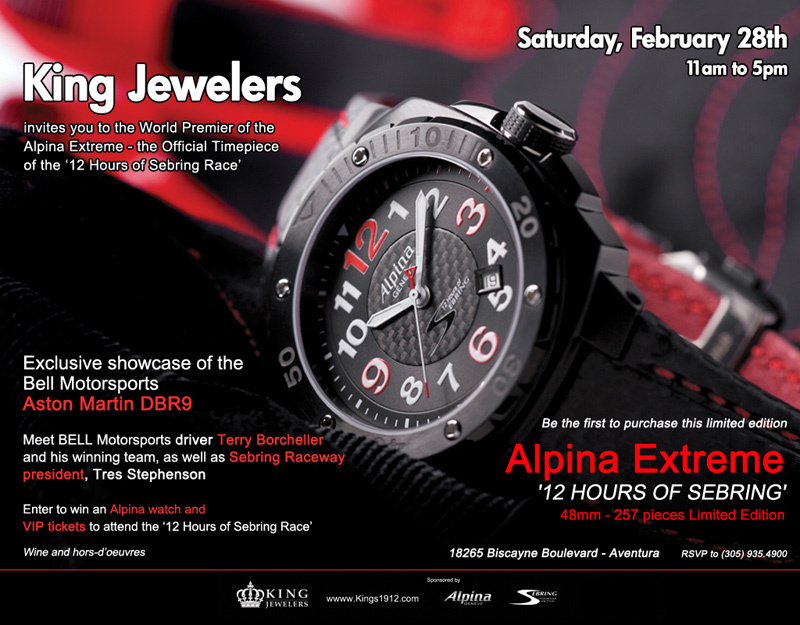 Starting at 11am on February 28th, King Jewelers will be hosting the world premiere of the Alpina Extreme ’12 Hours of Sebring’ official watch. For the 57th edition of this renowned race, Alpina, Swiss manufacturer of high quality sports watches, developed this exciting special limited edition. The watch capitalizes on the strong brand philosophy of Alpina, combined with the important requirements of the drivers in the race: highest level of accuracy, extremely high readability, shock resistance, sturdiness and reliability. 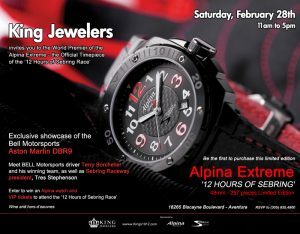 At the world premiere of the Alpina Extreme ’12 Hours of Sebring’ 48mm watch, a limited edition watch of 257 pieces worldwide; King Jewelers will have for sale series numbers 1 through 7 available, and will allow any other customer to pre-order the same day. Highlights of this special event will include a ‘Meet & Greet’ and autograph session with Bell Motorsport’s champion driver, Terry Borcheller. 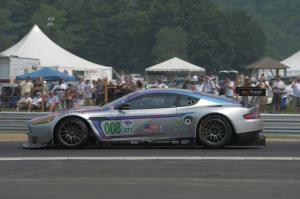 His Bell Motorsports Aston Martin DBR9 will be on display in front of King Jewelers for photo opportunities. Tres Stephenson, Sebring racetrack president will receive the first Alpina Extreme from the hands of Alpina Genève official USA representatives. Visitors will be entitled to enter to win an Alpina watch and VIP tickets to attend the ‘12 Hours of Sebring Race’ while enjoying wine and hors d’oeuvres. Experienced, Jim Bell and his team “Bell Motorsports” returned to the 2008 GT1 class of the American Le Mans Series with an Aston Martin DBR9 for a full-season battle against Corvette Racing. Bell is one of the most prominent names in sports car racing with 30 years of experience. He has worked on successful Series teams including Alex Job Racing, ACEMCO Motorsports and most recently Team Trans Sport in 2007. He also assisted in the overall win for the Kremer Porsche 935 at Le Mans in 1979. The Aston Martin DBR9 was built by Aston Martin Racing/Prodrive in 2005 season for the factory racing team’s international racing program in the American Le Mans Series in North America and the Le Mans Series in Europe. Cars like this are built for endurance road racing, with races running from three to twenty-four hours in duration. For the 2008 season, this was the only factory racing Aston Martin DBR9 in private hands. It is owned by Michael Fux, and is part of his impressive personal collection of automobiles. The car has an aluminum chassis, similar to the street version of the Aston Martin DB9, a carbon fiber body, and a race prepared six liter V12 engine. It weighs approximately 2550 pounds, with a 6-speed sequential gearbox, carbon disc brakes, and has a potential top speed exceeding 200 miles per hour. In the 2008 American Le Mans Series the car was entered, prepared and campaigned by Miami based Bell Motorsports in the GT1 Category driven by champion driver Terry Borcheller. It finished the season as GT1 Champion for the 2008 IMSA Cup in GT1, and finished in second place in the LMGT1 Team Championship. Terry has had an amazing professional career, winning 6 professional Sports car Championships and being runner up in two others. He has co-driven with some of the best drivers in the world. He has been to the prestigious 24 Hours of Le Mans four times, finishing every time and being on the podium the first year. He has won the most respected races in the sport including Daytona 24 Hours, twice, Sebring 12 Hours, and over 50 others along the way. He has had the opportunity to race all over the USA and around the world, in places like Europe, Canada, Mexico, Dominican Republic, and Australia. He has driven for over 20 different manufacturers. He has over 18 years of coaching experience with students from every spectrum.